Engraving of Parson's first 1 megawatt "turbogenerator" alternator driven by a steam turbine. It was installed at a plant in Elberfeld, Germany. 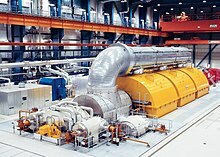 Smaller turbo-generators with gas turbines are often used as auxiliary power units. For base loads diesel generators are usually preferred, since they offer better fuel efficiency, but, on the other hand, diesel generators have a lower power density and hence, require more space. The efficiency of larger gas turbine plants can be enhanced by using a combined cycle, where the hot exhaust gases are used to generate steam which drives another turbo generator. The first turbo-generators were water turbines which propelled electric generators. Irish engineer Charles Algernon Parsons demonstrated a DC steam-powered turbogenerator using a dynamo in 1887. and by 1901 had supplied the first large industrial AC turbogenerator of megawatt power to a plant in Eberfeld, Germany. Turbo generators were also used on steam locomotives as a power source for coach lighting and heating systems. Unlike hydraulic turbines which usually operate at lower speeds (100 to 600 rpm), the efficiency of a steam turbine is higher at higher speeds and therefore a turbo generator is used for steam turbines. The rotor of a turbo generator is a non-salient pole type usually with two poles. The normal speed of a turbo generator is 1500 or 3000 rpm with four or two poles at 50 Hz (1800 or 3600 rpm with four or two poles at 60 Hz). Salient rotors will be very noisy and with a lot of windage loss. The rotating parts of a turbo generator are subjected to high mechanical stresses because of the high operation speed. To make the rotor mechanically resistant in large turbo-alternators, the rotor is normally forged from solid steel and alloys like chromium-nickel-steel or chromium-nickel-molybdenum are used. The overhang of windings at the periphery will be secured by steel retaining rings. Heavy non-magnetic metal wedges on top of the slots hold the field windings against centrifugal forces. Hard composition insulating materials, like mica and asbestos, are normally used in the slots of rotor. These material can withstand high temperatures and high crushing forces. The stator of large turbo generators may be built of two or more parts while in smaller turbo-generators it is built up in one complete piece. Based on the air-cooled turbo generator, gaseous hydrogen first went into service as the coolant in a hydrogen-cooled turbo generator in October 1937, at the Dayton Power & Light Co. in Dayton, Ohio. Hydrogen is used as the coolant in the rotor and sometimes the stator, allowing an increase in specific utilization and a 99.0% efficiency. Because of the high thermal conductivity, high specific heat and low density of hydrogen gas, this is the most common type in its field today. The hydrogen can be manufactured on-site by electrolysis. The generator is hermetically sealed to prevent escape of the hydrogen gas. The absence of oxygen in the atmosphere within significantly reduces the damage of the windings insulation by eventual corona discharges. The hydrogen gas is circulated within the rotor enclosure, and cooled by a gas-to-water heat exchanger. Fossil fuel based power generation is predicted to continue for decades, especially in developing economies. This is against the controversially claimed global need to reduce carbon emissions, of which, a high percentage is produced by the power sector worldwide. ^ "The turbogenerator – A continuous engineering challenge" (PDF). Archived from the original (PDF) on 2010-08-21. ^ Smil, Vaclav (2005). Creating the Twentieth Century. Oxford University Press. pp. 63–64. ISBN 0195168747. Archived from the original on 2018-02-11. ^ Basic Electrical Engineering (Be 104). McGraw-Hill Education (India) Pvt Limited. p. 8.1. ISBN 978-1-259-08116-3. Archived from the original on 11 February 2018. Retrieved 8 August 2017. ^ Basic Electrical Engineering (Be 104). McGraw-Hill Education (India) Pvt Limited. p. 8.3. ISBN 978-1-259-08116-3. Archived from the original on 11 February 2018. Retrieved 8 August 2017. ^ Basic Electrical Engineering (Be 104). McGraw-Hill Education (India) Pvt Limited. p. 8.4. ISBN 978-1-259-08116-3. Archived from the original on 11 February 2018. Retrieved 8 August 2017. ^ National Electrical Manufacturers Association (11 February 2018). "A chronological history of electrical development from 600 B.C." New York, N.Y., National Electrical Manufacturers Association – via Internet Archive. ^ "Aeroderivative & Heavy-Duty Gas Turbines - GE Power". www.gepower.com. Archived from the original on 2010-05-05. ^ "What is ETC". Bowman Power. Archived from the original on 2018-02-11. Retrieved 2018-02-08. ^ "Modelling a Turbogenerator for Waste Heat Recover on a Diesel-Electric Hybrid Bus" (PDF). Ian Briggs. Archived (PDF) from the original on 2017-05-16. Retrieved 2018-02-08. ^ "Electric Turbo-Compounding: Helping make distributed power systems more efficient". Kenya Engineer. Archived from the original on 2018-02-09. Retrieved 2018-02-08. ^ "Less Fuel, Reduced CO2". Bowman Power. Archived from the original on 2018-02-11. Retrieved 2018-02-08. ^ "Turbo Compounding, A Technology Who's Time Has Come" (PDF). Carl T. Vuk - John Deere. Archived (PDF) from the original on 2018-02-09. Retrieved 2018-02-08. ^ "Competitive Advantage". Bowman Power. Archived from the original on 2018-02-11. Retrieved 2018-02-08.